Sotetsu Group, a Yokohama-based corporation that runs Sagami Railway Train and businesses, announced on May 25 that it will open a new type of specialized-accommodations hotel with smaller-sized rooms at lower cost near Hankyu Karasuma Station, Shimogyo Ward, Kyoto, in October next year. It has been planned in response to the demand for accommodations due to an increasing number of foreigners visiting Japan. The new hotel will have six floors with 150 guest rooms. 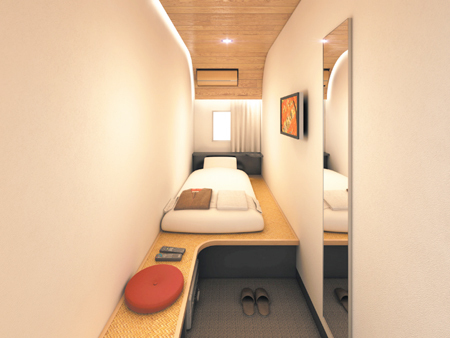 As a "simplified private-room" type hotel, it will be less expensive than usual commercial hotels, and the interior comfort will be higher than that of capsule hotels. As small as five square meters, a single room are ensured to have lockable doors and sound insulation, with a price as low as approximately 5,000 yen a night. Twin rooms and family rooms will also be available. A floor for female guests' exclusive use is also planned. Sotetsu Group is starting in Kyoto to open its first hotel of this type, and plans to expand into major cities across Japan. This hotel is the group's third facility in Kyoto, following the "Sotetsu Fresa Inn," or business hotels opened in April in Shimogyo Ward and Minami Ward.